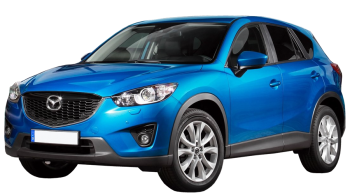 The CX-5 from Mazda is the first Sport Utility Vehicle of its firm and it is facing a strict competition from opponents like VW Tiguan and Ford Kuga. In the first look the appearance of a high riding hatchback is reflected than an off- roader. The proportionality criterion is good and unlike its competitors it is not cumbrous. In all models wheels are of alloy and bumpers are body colored also bi-xenon headlamp and 19 inch rim have been included. Compared to its competitors like Audi Q3 the design of dashboard is a bit dull. There is an inclusion of Bluetooth, dual zone climate controls and touch screen infotainment system. The elevated position from driving allots visibility options to this vehicle and the position for driving is good also. The 2-stage turbo provides a smoother delivery of power and 2.2 L diesel is a good performer as well. Operating the gearbox is a wonderful experience and the remaining prominent controlling options weigh properly and operational precision can be expected from them as well. All in all driving this vehicle is a joyful experience upon a twisty back road. An important point to mention is that such a dynamic composure is not being provided by making a compromise upon the comfort level as it efficiently deals with thuds and no disturbance is made by the noise of wind either. The models, which are four-wheel drive allot composure supporting traction in conditions where there is a lot of slip and can move off-road as well, but in comparison to Land Rover Freelander this is no match. Customary controls related with stability have been included and also there is an inclusion of 6 airbags. However, the point to appreciate is that NCAP gave this vehicle 5 star ratings and this has leveled it with Kia Sportage and Ford Kuga. In comparison to Ford Kuga Mazda CX-5 offers more due to the 503 liter boot. Considerable 1620 luggage space can be provided by folding the seats. One more decent specification is Karakuri, which moves away when opening of tailgate is carried out and this makes easy to load things in boot. Cabin is smartly laid as well and good storage options are present.